Red eyes, big yawns and a little crankiness: warning signs to reach for the Nap N Sack and avoid a meltdown! 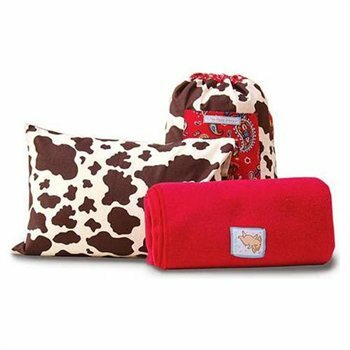 This handy pack is equipped with a Cow print child sized pillow and super fuzzy fleece blanket. The machine washable sack pack can be used over and over for other toys, books or stuffed animals too. A pocket space for embroidery makes it essential for traveling on day trips or grandma’s house. Kids will gladly take a nap with this fun set!